The original deck image builder was created and integrated by PlanPlan. The latest version was created and integrated by antiaverage. The images in this thread were updated and formatted by Chapuz. 1. Click in the Import/Export button, which is right at the left of your deck. You will notice a code appears. Select that code and copy it. 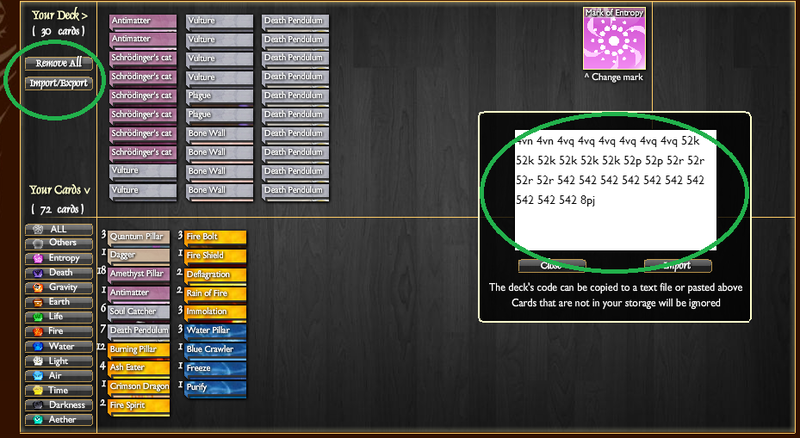 Note: Each 3-digit code represents a card of your deck, with the last one being the code of your mark. 2. When writing your post, look for this icon: and press it. You will see a pair of "deck" brackets appears. 4. Look at the deck image appear out of nowhere with the deck import code below it. Thanks a ton! I was looking how to do this earlier! No need in this forum section because there are so few threads. Is there anyway we can a section on the forums/wiki where we can 'preview' decks from other peoples code? Maybe a tab up at the top with "Deck Preview"
A lot of people either ask for your deck or want you to look at their deck. Is there any way we could do that without posting a new thread (or acting like you are posting)? I personally don't see a huge demand for this kind of thing, but if someone makes us the Card Code Builder, it could be easily made so that it works the other way around as well. I have a solution for that, actually. Just embed Planplan's app in the 'Resources' section of the forums. Planplan still has the builder up at his own place as well. I don't know how well his host copes with the pressure of this community though... Having a standalone version either on the forum or the wiki could be good. I didn't know there was a standalone hosted somewhere (or at least i didn't know where to get it). That helps a lot. Thanks. I must be stupid or something, I copied "